I booked myself into a dead plush hotel for the four days over Christmas I’d be spending in Siem Reap, Cambodia. I say dead plush, it was only $30 a night but it was about 5 times the price I’d paid anywhere else in the last five weeks. By British standards, the cost of the 4 nights combined would get you a cobwebby single room in a below par B&B with a disappointing breakfast and a grumpy patron, if you were lucky. Here though, it meant a huge room complete with mini bar, an actual functioning AC system, bath tub and a flat screen telly (which of course I didn’t watch because everything was in Khmer) but still, it was there! I spent Christmas morning alternating between reading on a sun lounger sipping a cold Angkor beer and taking a cooling dip in the shaded pool. 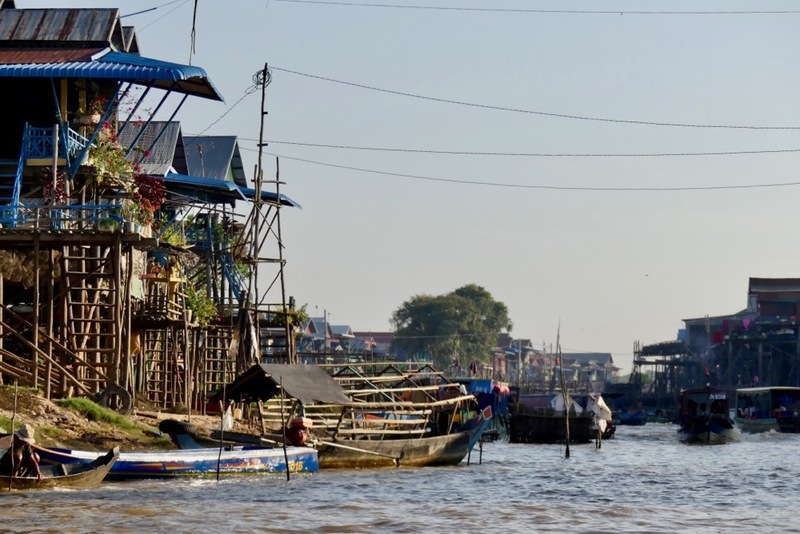 With a tour of a local floating village and Tonle Sap lake organised for the afternoon I had license to be as lazy as I wanted to be in the morning. I ambled out of the hotel in the early afternoon for a bite to eat and chose an eco friendly cafe just next door for my Christmas lunch. I ordered a bowl of Khmer Chicken noodles and patiently waited for them to arrive while thirstily glugging a glass of iced sugar cane juice in the 32 degree heat. Blissful! However, what arrived was less ‘ah bliss’ and more ‘oh bloody hell what IS that?’ My hues-of-grey Christmas lunch was filled with whole chicken feet, boney fragments of a mutton like meat and topped with huge chunks of some sort of greyish purple offal. 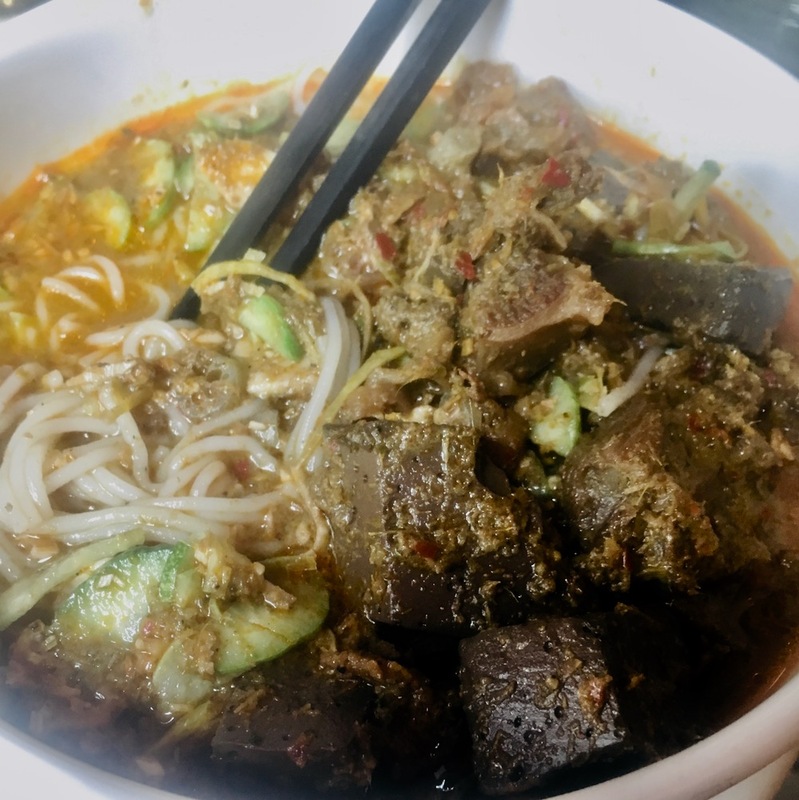 The gag reflex jumped into action and I eventually gave in and chose to pick around the lumps and fill up on the rice noodles lurking below the oily orangey liquid. So Christmas lunch hadn’t gone to plan, but I still had the tour! With that in mind I didn’t allow my Facebook friend’s pictures of golden roasties, boneless meat and gravy soaked Yorkshire puds get me down. Not quite what I had in mind for my Christmas lunch! I waited patiently in the hotel lobby for my tour pick up. And waited. And waited. And waited some more. 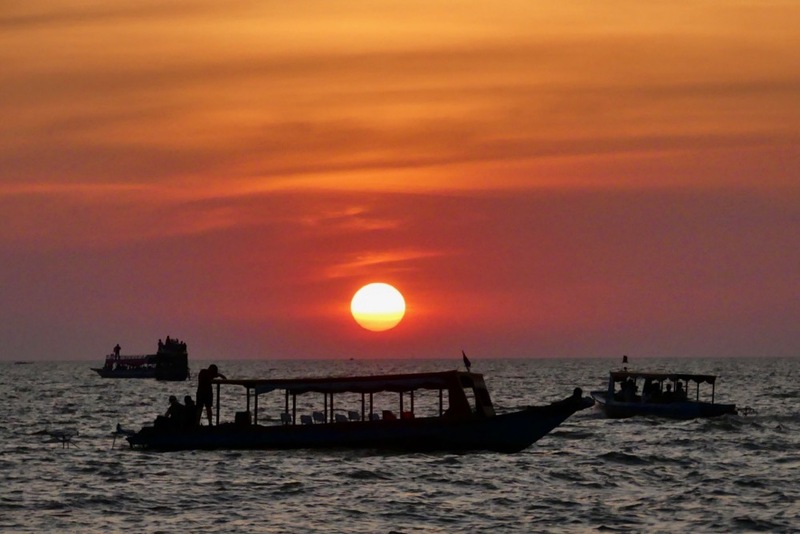 Until, I eventually decided it had gone passed the point of endearing Cambodian laid back lateness and had began eating away at my inherently British desire for punctuality. If there’s one sure way to piss a Brit off its lateness (that and people pushing to the front of a queue you’ve been stood in for too long). The hotel rang the company and I was plainly informed ‘yes, they’ve forgotten you’. I was bundled into a tuk tuk and told the driver would race to catch up with the bus. And race he did. 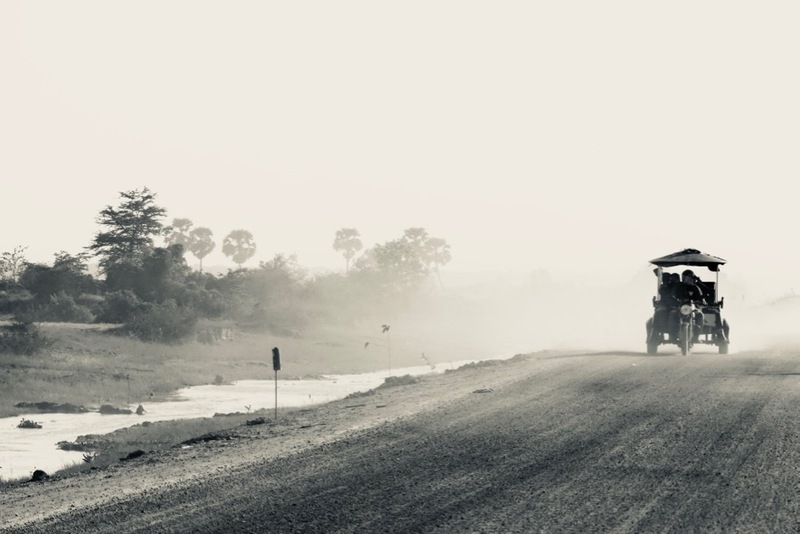 Overtaking trucks and motorbikes on the highway before veering right onto a bumpy, dusty lane towards the lake. Every time we hit a pothole he glanced around, presumably to check I was still onboard. ‘First time I ever drive this fast on tuk tuk’ he proudly exclaimed when I ungracefully disembarked on wobbly knees at the dock. Taken from the back of the tuk tuk during our race to catch the bus. With still no sign of my tour group I was briskly ushered to a boat about to leave and dragged aboard by the skipper. The french family of five onboard glared suspiciously at the bewildered British girl who was to photo bomb their family Christmas Day selfies for the next 20 minutes. Offering to take a picture of them all together (usually always a winner) was greeted with a steely frown so I gave in and relaxed into the journey, watching the stilt houses rising precariously but elegantly from the ground to the sky. 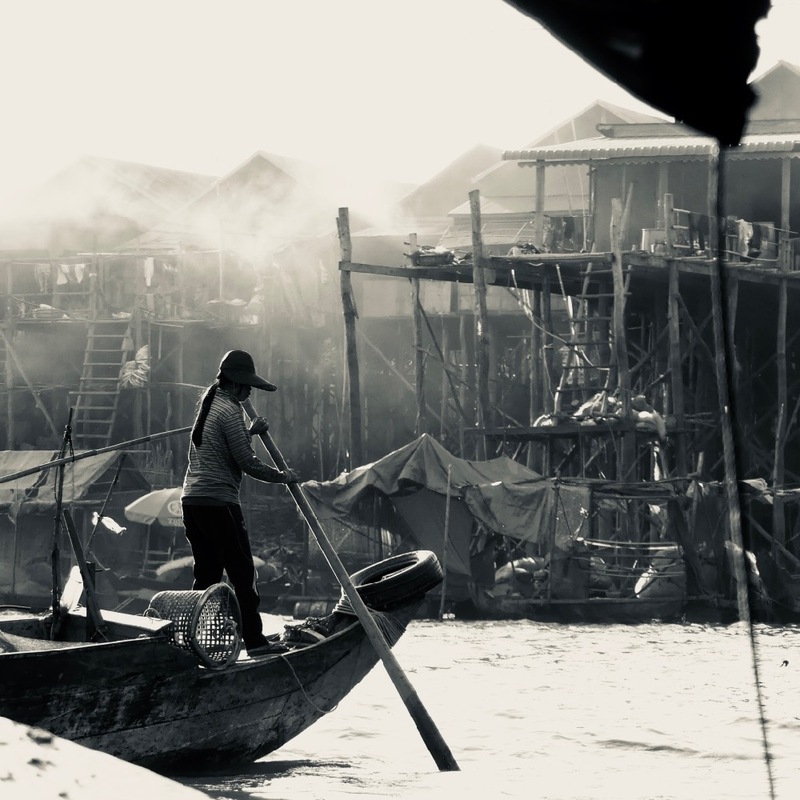 Stilt houses along the riverbank, built tall enough to withstand the high water levels during the rainy season. A local navigating through a watery suburbia. At the next dock, or muddy embankment rather, I was worryingly aware that I only had $5 on me and if I needed to get back to Siem Reap alone the 20 minute boat ride and hour in a tuk tuk would cost far more than that. It was paramount I found my tour group. A muddy barefoot child beckoned me and I followed him into the village where he pointed at a mathered looking man sporting a lanyard and an only slightly apologetically embarrassed expression. I had found my tour guide! The next hour of the tour was what you’d describe as a bit of a rip off. The $5 extra we paid for a ‘relaxing half an hours row through a flooded forest’ was actually a ten minute clumsily navigated row through some trees whose lower branches were adorned with the occasional stray plastic bag. I felt bit like a pinball being banged from tree to tree and started to dread the inevitable ‘tip, tip, tip’ when it came to disembarking. Turns out I wasn’t the only one who found this part of the tour more than a little disappointing. On the floating restaurant where we alighted I was greeted by a disgruntled chorus of fellow day trippers demanding their $5 back. The tour guide was looking more mathered by the second while more people joined the angry protest. Instead of joining in I awkwardly twiddled my thumbs at the waters edge secretly agreeing with the mob but also certain that no amount of ranting would yield a refund. Next, the final part of the tour. 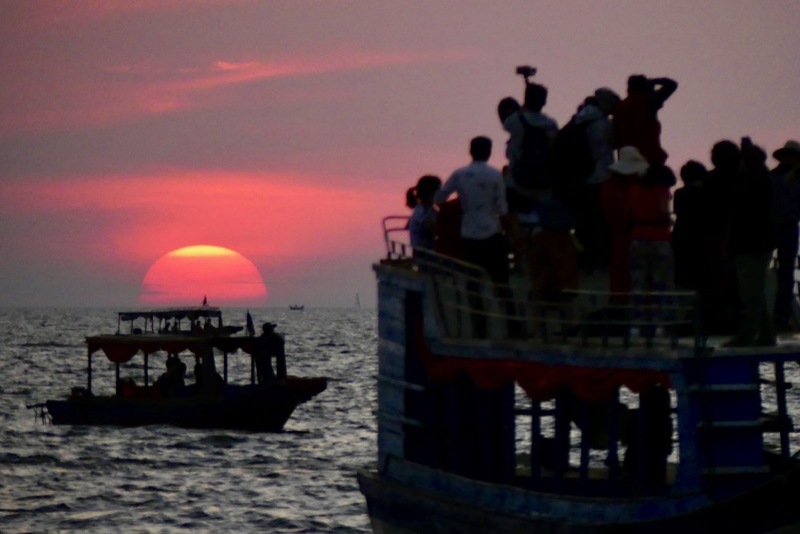 To watch the sunset over South East Asia’s largest lake, the Tonlé Sap. We watched in awe as the huge yellow, to orange, to red glowing sphere melted into the horizon in a very typically beautiful Asian sunset. 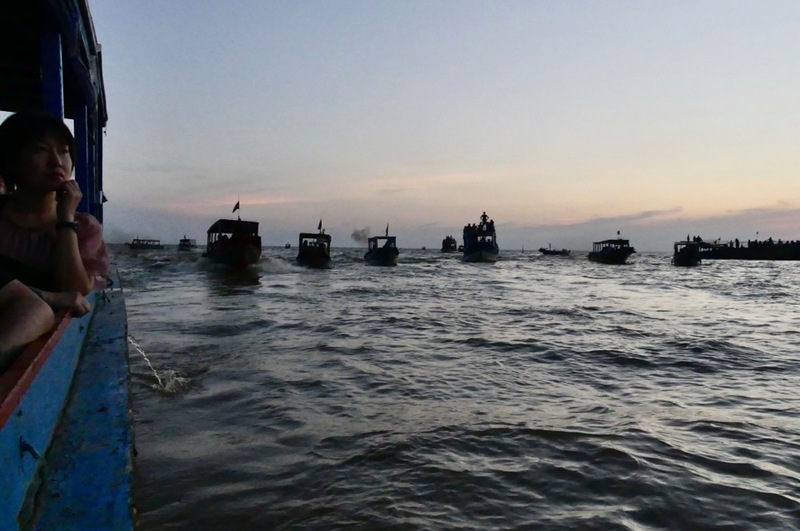 About 30 boats all bobbed around on the periphery of the lake and for a couple of moments I had a strange feeling inside as I realised our joint purpose was to watch the sun set, like some sort of pilgrimage. 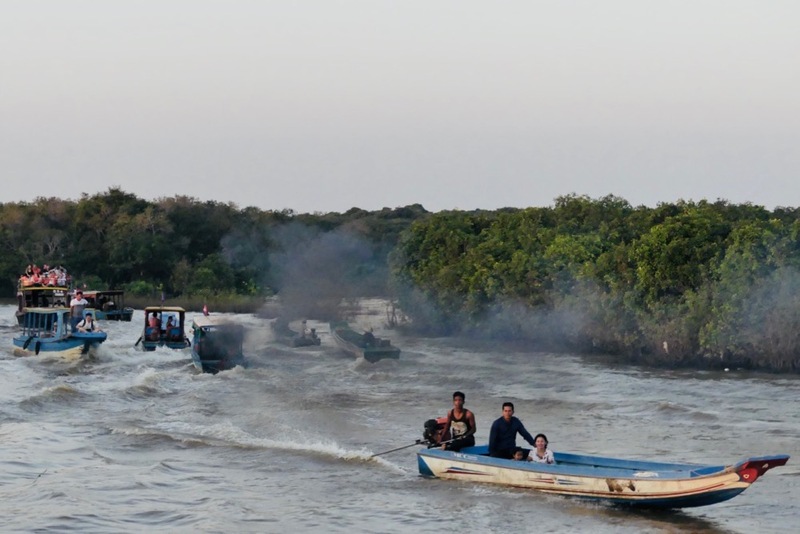 After the curvature of the red glow vanished, the warm fuzzy feeling was quickly replaced by guilt at the sight of acrid black smoke billowing from each of the 30 boats as they raced back up the mouth of the river. My Finish day trip companion commented that the scene reminded him of a time he visited the UK… and was stuck in a huge traffic jam on the M5 towards Bristol for three hours. It felt like a laugh or cry moment. 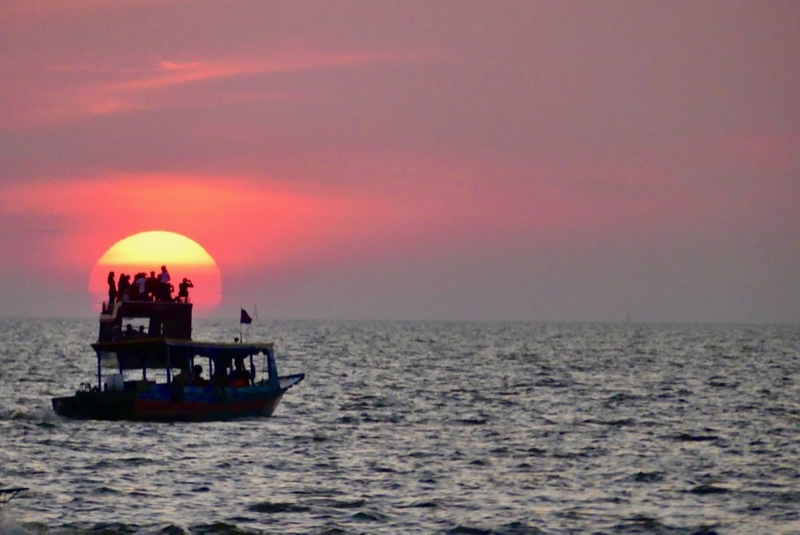 …which soon lost its magic when all the boats sped to the river mouth. Desperate for something recognisable for dinner I opted for a pizza at a very western looking establishment in the city before heading back to the hotel to call my Mum, Dad and Granny. One way or another, it had definitely been a Christmas Day to remember!